NOTE: yes that is really Andy in there, not photoshop. He walked down a few rows and asked to put it on for the shot. They were more than happy to oblige. The first shoot out in penalty kicks of World Cup 2010. 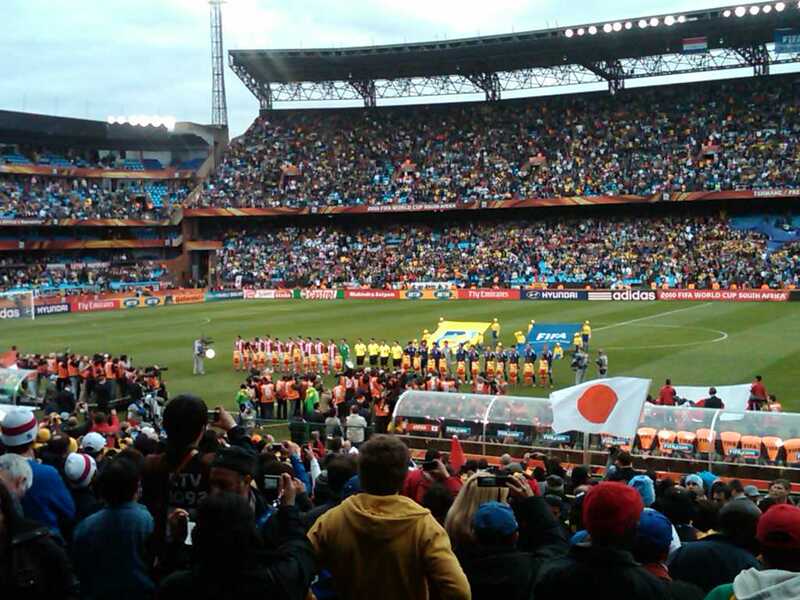 We got lucky to be part of it as Japan played a better game clearly in our eyes. They had a definite edge over Paraguay the whole game but couldn’t get a goal to go. Both teams were well celebrated for all their hard work at the end from the entire crowd. All our videos and pictures online shortly at our vVorldcup pool in Flickr. 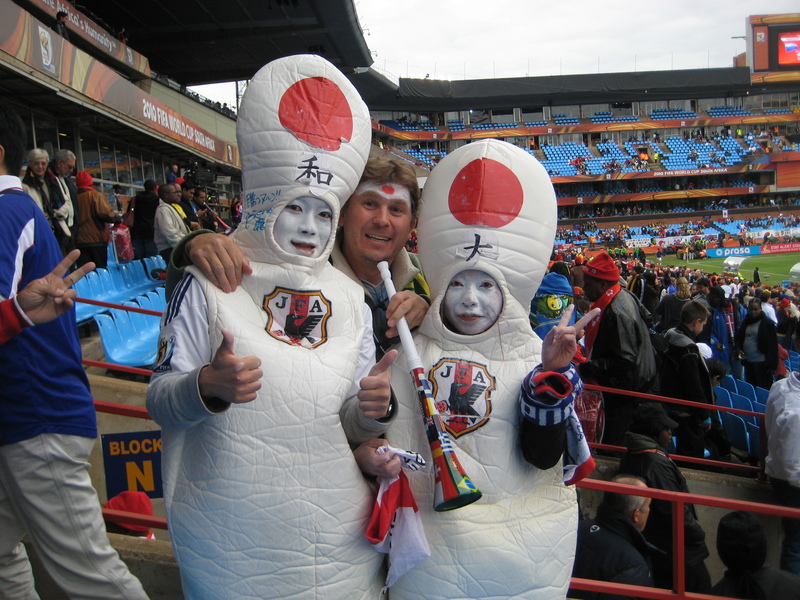 Our first trip to the stadium Loftus Versfeld in Pretoria for World Cup 2010. A beautiful, yet oldest, stadium we have been to. The crowds are still filling in even as the game started. The fans here are quieter. Might be the teams or might be the location. But it is still fun to watch the outfits and cheering commence. You can hear vuvuzelas long before games begin each night. You hear them in cars, people walking and selling in the streets. What happens after the game completes? Does the sound die for a few hours? See this video from Park Station in Johannesburg long after Argentina won against Mexico. Another trip to Soccer City in Johannesburg. 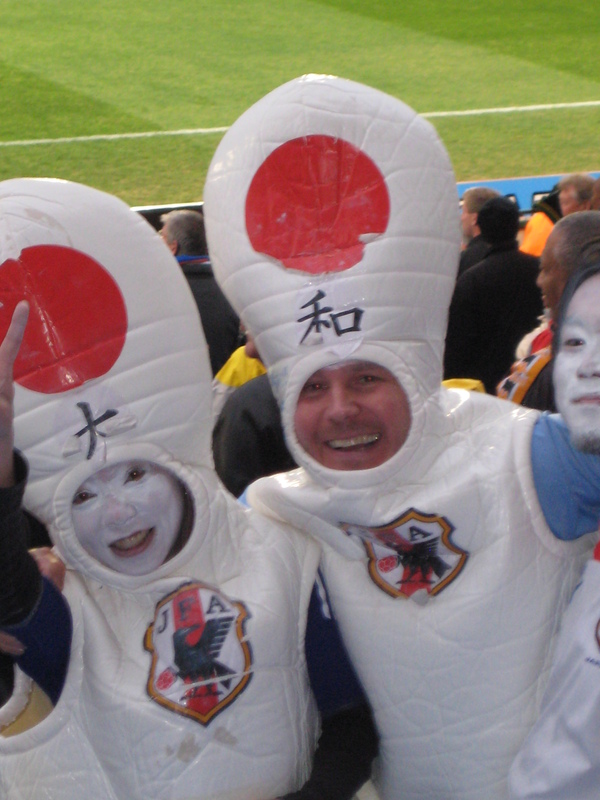 We were off to see Argentina and Mexico in the final 16 at World Cup 2010. We took our normal route of driving to Park Station to catch the direct, free train to the stadium that is offered for games. This is our third trip using the train and we think we have a system worked out in parking, getting on before and after the game and then getting away from the traffic. One of the benefits of riding the trains is interacting with fans of the teams about to play, and fans that just love the sport and want a good game. Carl was able to grab an interview with another group today on the train ride in. As you can see, it isn’t hard to find awesome people everywhere we go. We get insight into things to do, how the city was before the games and what they hope it will be in the future. Once off the train today we sensed the size of the crowd would be different as we enter the final 16. TV stations, cameras and crews were all over the grounds between security and ticketing. Once again we stole some lighting to make our own intro shot. Both Argentina and Mexico fans were fully dressed out and ready to show support. Carl has a ton of pictures in the VVorldCup picture pool on Flickr. 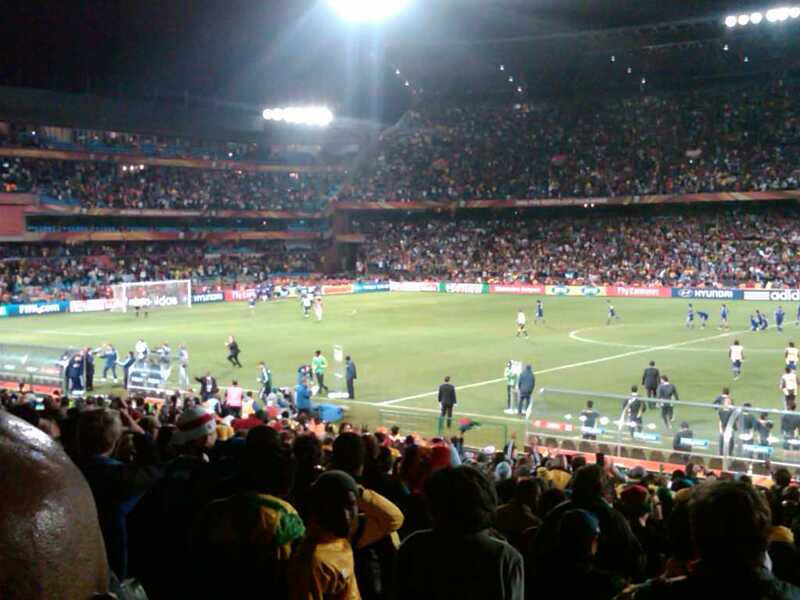 The game was well played by both sides, much better than Portugal and Brazil the other day in Durban. We had our first encounter with some fans that had a bit much to drink. They didn’t have issues with us, but with each other in close proximity of our seats. It goes without saying that the fun of that moment escapes until the issue is resolved. Once that passed, everything jumped back to normal being loud and fun. We stuck around long enough to watch the stadium empty and take more pictures with fans and of the pitch. Look at the Flickr album to catch them all.